After getting the approval from TENAA a couple of days back, Samsung has announced the new tablet Samsung Galaxy Tab A (2017) in Vietnam today. The tablet is available for sale in the country priced at 6490000 Vietnamese Dong (around $285) for the 4G variant, however, no details are currently available when it will be available outside Vietnam. The tab was previously spotted listed by GFXbench revealing its specifications. This new tablet features full metal unibody design and has a home button and recent apps and back buttons as well. 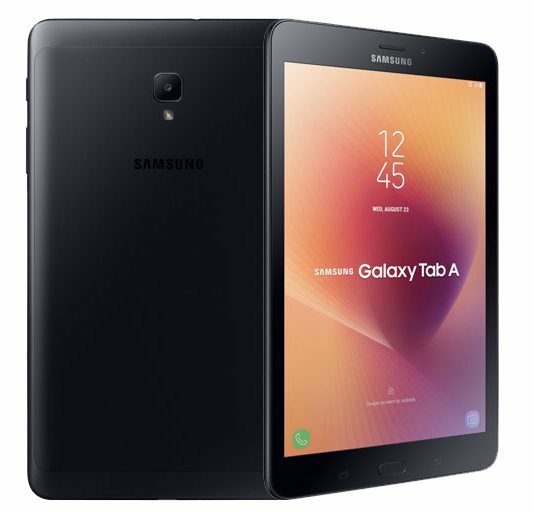 The Samsung Galaxy Tab A (2017) features an 8-inch WXGA TFT display with 1280×800 pixels resolution and is powered by a 1.4GHz Quad-Core Snapdragon 425 processor with Adreno 308 GPU. It comes with 2GB of RAM and 16GB of internal storage capacity that is expandable up to 256GB with microSD card. It runs on the Android 7.1 (Nougat) OS out of the box. In the camera department, the tablet comes with an 8-megapixel autofocus rear camera with LED flash with f/1.9 aperture and has a 5-megapixel front-facing camera also available for video chats and others. The tablet comes powered by a 5000mAh battery and features 4G LTE with voice calling(Optional),WiFi a/b/g/n (2.4 + 5 GHz), Bluetooth 4.2 and GPS + GLONASS / Beidou connectivity options. It measures 212.1 x 124.1 x 8.9mm and weights 364 grams. The Samsung Galaxy Tab A 2017 was spotted listed by TENAA with a 8-inch display which is expected to have a 1200 x 800 pixels resolution and it comes with the power and volume buttons on the right. The device was spotted at GFXbench with a 1.4GHz quad core Snapdragon 427 processor with the Adreno 308 GPU and it comes with 2GB of RAM with 16G of inbuilt storage capacity. The tablet will be running the Android 7.0 Nougat OS out of the box and will feature a 8-megapixel rear camera with an LED flash along with a 5-megapixel front facing camera. To recall, the Galaxy Tab A 2016 was launched last year with a 10.1-inch WUXGA TFT PLS display, a 1.6 GHz octa-core Exynos 7870 processor, 3GB of RAM, 32GB internal storage, expandable storage up to 256GB with microSD card slot, Android 6.0 (Marshmallow) OS, an 8-megapixel autofocus rear camera with LED flash and f/1.9 aperture, a 2-megapixel front-facing camera with f/2.2 aperture. It is backed up by a large 7,300mAh battery and connectivity options includes 4G LTE,WiFi a / b / g / n / ac (2.4 + 5 GHz) , Bluetooth 4.2 and GPS, GLONASS and Beidou. It measures 254.3 x 164.2 x 8.2mm and weights 558 grams. Color options includes Black and White.